Kino does a bang-up job in its presentation of Louis Feuillades’ (Les Vampires) five silent Fantômas films from 1913 to 1914. This quintet of European espionage serials based on a series of popular French pulp novellas are truly a sight to behold, their cold blues and sepia tones beautifully restored with a terrific score from Sonimage, a French library label. 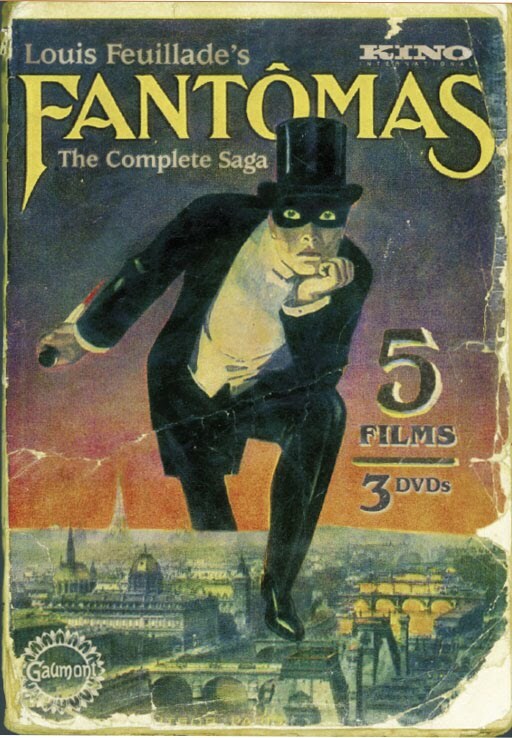 Crime lord Fantômas slithers across rooftops and through the sewers of Belle Epoque Paris, heisting jewels, kidnapping, murdering, seducing, abandoning and always finding a trap door or some other means of escape. 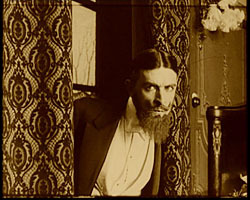 Brilliantly played by Rene Navarre with hypnotic intensity, he is a master of disguises. On his trail is Inspector Juve (Edmund Breon), meek in appearance, dogged in tenacity and with a few disguises of his own. Another character that would become a movie staple is young reporter Jerome Fandor (Georges Melchior), who joins Juve in the chase. Feuillade’s films are the Rosetta Stone of crime melodrama. In an episode that foreshadows 1948’s The Big Clock (and all its remakes), Fantômas (in the guise of “American detective” Tom Bob) leads a manhunt for himself. He also persuades a princess to offer a reward, which he, naturally, steals. The films even pre-echo 24 when a character’s hand is skinned to steal the fingerprints. The French have paid director homage to Feuillade in such films as Georges Franju’s Judex (1963) and Olivier Assayas’ Irma Vep (1996). Of course, there are silent movie clichés in performance and action (a train wreck owes Lionel a credit), but who cares? Gigi-era Paris appears as itself; the women have hourglass figures and are beautifully draped; Montmartre nightclubs, artists’ studios and thieves’ dens reek with decadence. Salut, Feuillade! The outstanding package of supplements on this DVD includes a pair of audio commentaries by film historian David Kalat, as well as two additional Feuillade shorts: The Nativity (1910) and The Dwarf (1912). Fiinally, there is a 10-minute documentary on the filmmaker that was previously seen on Kino’s Gaumont Treasures: 1897-1913 DVD box set from last year. Hello there. I am wondering if you’d be interested in doing a website link exchange? I see your website: and my blog are based around the same subject. I’d really like to switch links or perhaps guest author a article for you. Here is my personal email:. Please be sure to contact me if you’re even slightly interested. Thanks for your time.